Here comes the glitter again. I have a feeling that none of this was bought right off the rack. Her worn-in Converse and faded jeans give her overall look a thrown together vibe which may or may not be even accurate. In any case, Josanne has a fun rock look, without losing her fresh feminine feel. I stopped her on the Monmatre streets in Paris – although she calls Holland home. Josanne. Rockin’ Paris. This girl was radiating; and I don’t just mean her bright yellow Converse. I spotted her on the main shopping street in Stockholm and her outfit and energy immediately grabbed my attention. I love the pop of color she uses. 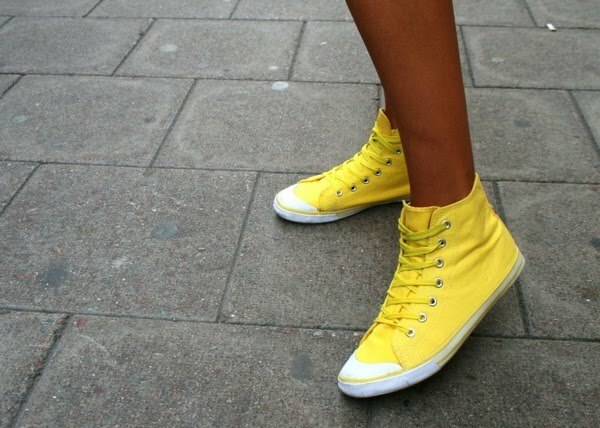 You can see aspects of fall creeping in, yet the bright yellow Converse bring it all back to some summer fun. It’s like an outfit mullet – business on top and party on the bottom. 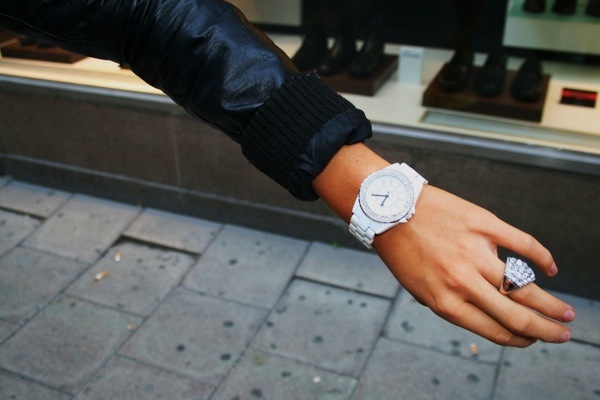 I loved her accessories: bright white watch, bedazzled rings and oversized silver hoops. Ingrid. Great look…and the cutest giggle.